Solunet Review 2019: Is Solunet a Good Hosting? Solunet Group is a telecommunications and hosting provider located in Buenos Aires. They use powerful, first-class data centers to offer their customers reliable, high-availability hosting in Argentina and other parts of South America. 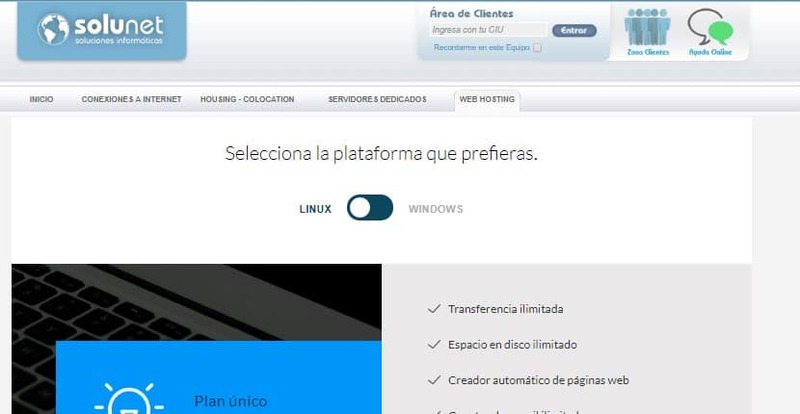 Solunet has been growing steadily in the website hosting niche in Buenos Aires, Argentina for quite some time now. They’ve become increasingly popular in South America. According to a number of people who have used their services, the company lives up to their promise of excellent web hosting services while keeping their prices extremely affordable. This is perhaps the reason that it’s such an appealing option for startups and small businesses. At the moment, their website is only available in Spanish. There’s only one Linux shared hosting plan, unfortunately, so it does limit your options. However, this lone plan includes everything you could possibly need to establish a solid online presence for your startup or small business, so you won’t have to worry about scaling up your plan until a much later stage. Alternatively, if you require Microsoft-specific features, they also have Windows shared hosting plans available. These come with the Plesk control panel and start you out with 10GB monthly bandwidth, 1GB disk space, up to 200 email accounts, and an antispam / antivirus filter. Solunet also offers server colocation services, cloud servers, and dedicated server packages, should you ever need to upgrade to an enterprise-scale plan. Few website hosting providers in Argentina can match the perfect combination of inexpensive prices and robust services quite like Solunet. No wonder the company continues to dominate the web hosting industry even at a time when there are many new entrants in the market. One of the most attractive features of all Solunet hosting plans is their antispam/antivirus filter that’s included even in their cheapest hosting solution. This is likely why the company has been quite popular with personal bloggers and website owners looking to securely set up their very first website. Solunet is the hosting company to work with when you can’t afford to compromise on the security and functionality of your website, yet want to stay within a tight budget. The company has also invested heavily in their state-of-the-art security protocols and redundancies to deliver unmatched reliability. Solunet’s straightforward process of upgrading and downgrading hosting packages gives them a noteworthy advantage. They also employ advanced security measures to protect their clients’ websites from DDoS attacks and other hacking attempts. The downside of this web hosting provider is in their technical support. With so little information about the steps a customer should take when faced with technical challenges, clients may be easily frustrated, especially if they’re beginners. In addition, all the calls I tried making to them did not go through. Fortunately, the support team responded to my emails after some time, providing me with somewhat helpful information about their hosting solutions. 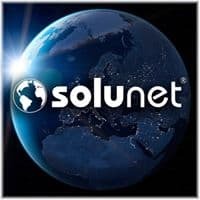 Solunet is a decent website hosting vendor for Argentinian businesses that cannot afford interruptions to their website connectivity. However, while their service is good, their support could still use some refining. Wondering how Solunet stacks up against other Web Hosting companies? Enter any other Web Hosting company and we will give you a side-by-side comparison.